RevenueWell is a Patient Communication System that adds several features to Patterson Eaglesoft. These features automate otherwise time consuming activities that often don't get done. The primary reason the client wanted RevenueWell was to automate the process of sending out reminders and receiving appointment confirmations. RevenueWell does this and much more. RevenueWell is a marketing tool to help grow your dental practice through a well put together combination of web page and direct mail marketing, e-mail, and texting. These tools are used to keep existing patients coming back, as well as attract new patients. RevenueWell can do things like dig through your Patterson Eaglesoft database to find out who has not been in for a visit in a while and invite them back. RevenueWell can be used as a tool to market elective services and make patients more aware of available treatments. RevenueWell makes your office run more efficiently by automating the process of patient appointment reminders and confirmations in order to reduce No-Shows. Patients are encouraged to sign up for text and e-mail reminders. If they do not respond to text or e-mail, then a postcard can be automatically generated and sent out. The costs of these reminders, which can be up to a couple dollars per appointment, depending on how soon the patient confirms, is well justified when considering the cost of patients not showing up for appointments. If the patient responds to the first text, then the cost is low. 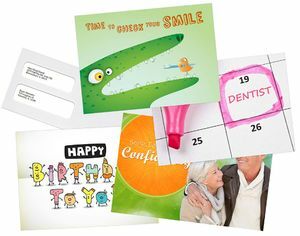 If a postcard or two need to be sent out, then it is more expensive, but still a lot less expensive than a missed appointment. RevenueWell offers, as an optional service, the printing and posting of cards and mailers. When compared to the cost of staff filling out and sending out cards, this seems like another good way to save money. I was impressed by the ease and flexibility that enable you to design your own materials by uploading your own logos, or choosing one of their many designs. This flexibility is quite similar to ordering business cards or postcards from VistaPrint. RevenueWell can give new patients the impression that your practice is really on top of things. New patients are invited to sign up for a patient portal website where they can start filling out HIPPA forms. This patient portal can be used to publish information about the services you offer, or the concerns they may have. This information can be in the form of downloadable documents, or even on-line video. The patient portal can also be set up to show the patients' billing and appointment history, as well as insurance information. This type of "Patient Portal" is cutting edge technology today, but will be the expected norm in the future, if you wish to stay competitive. After many years of installing and supporting Patterson Eaglesoft at dental practices around central Indiana, I must say that I am highly impressed with RevenueWell. After backing up the server which runs the Patterson Eaglesoft database, the installation only took a few minutes as the RevenueWell installer worked with me over the telephone, remotely accessing one of the workstations. The workstation was logged into the server via Terminal Services, because I am very much against remoting directly into a server using WebEx or similar programs. A telephone / remote access training was scheduled a week after the installation. During this time the office was given the task of getting their logo ready to upload, and thinking about how they wanted to use the many options for communication with patients. The training went smoothly as we sat around a workstation and watched the trainer remotely go through the various features of RevenueWell, using the actual data from Patterson Eaglesoft. Once the training was completed, RevenueWell was ready to start sending out appointment reminders and invitations to sign up for text and e-mail communications. I had a few highly technical questions that I wouldn't expect a trainer to be able to answer. The trainer noted my questions and had one of their engineers on the phone with me within an hour telling me exactly what I wanted to know. I was well satisfied with their technical service. While I am highly impressed with RevenueWell, I also see a lot of potential for future development. I have been working with the topics of HIPPA Compliance, and Effective Use Certification for a while now and I see RevenueWell as a fantastic tool that can help in both areas. There is a HIPPA requirement that patients must sign a form consenting to electronic communication. HIPPA also requires that certain information be made available to patients, which is a great use of RevenueWell's patient portal. A big part of Effective Use has to do with patient communication. Practices that take Medicare/Medicaid are required to implement partient portals and communications. I hope that RevenueWell realizes this potential in the near future. While there are other products that do functions similar to RevenueWell, I am impressed by how RevenueWell draws on information directly from the Eaglefsoft Database. This is because of the close relationship between RevenueWell and Patterson. I was told that their support centers are located in the same building. Unfortunately, RevenueWell only works with Patterson Eaglesoft.